Austin All Roof is ready to provide you with custom gutters to fit the exact needs of your home. Every home is slightly different. We take the time to measure and plan your entire system from start to finish. By customizing the gutters to your home, we can provide the best fit for your home’s needs. We offer a variety of gutter styles and materials. There is a solution to match the aesthetics of every home. From decorative to economical, we can customize an option to fit any budget. Talk with the team today to figure out the perfect match. Regular cleaning of your gutters is important to maintain the flow of water. Many times, homeowners forget about gutter cleaning until it is too late. A clogged gutter can send water straight into the eaves of your roof, causing water damage, rot, mosquito infestations, and mold. It can also send water down the walls of your home, causing damage to drywall, interior paint and wallpaper, even causing cracks in your foundation. Instead, let the professionals clean your gutters. We’ll remove debris blocking the flow of water, getting things flowing again. Our team brings all the equipment needed to reach your gutters and clean even the biggest clogs. Gutters need cleaning twice a year, once in the spring and once in the fall. If your home is near a lot of trees, it may need more frequent cleanings to remove excess leaves. While we are cleaning your gutters, we will also check for any loose spots, cracks, or leaks. We can recommend repairs to help keep your gutters in the best shape possible. Inspections now will help you save money on repairs later down the road. If you are experiencing gutter problems, call us today for a free evaluation and estimate. We can help you get your gutters back on track. Gutter technology has improved in recent years, yielding seamless gutters. Older style gutters came in sections, welded together at the time of installation. Seamless gutters come in one piece and in custom lengths made to fit your home. Our team will measure your home and bring the materials to the job site ready for installation. Seamless gutters are less likely to spring a leak, prolonging their life. Ask about installing a new seamless gutter system on your home, keeping your home dry. Keeps your basement and foundation dry. Keep rainwater from staining your deck and siding. Prevent pooling around your foundation. Discourage insects from breeding in standing water. 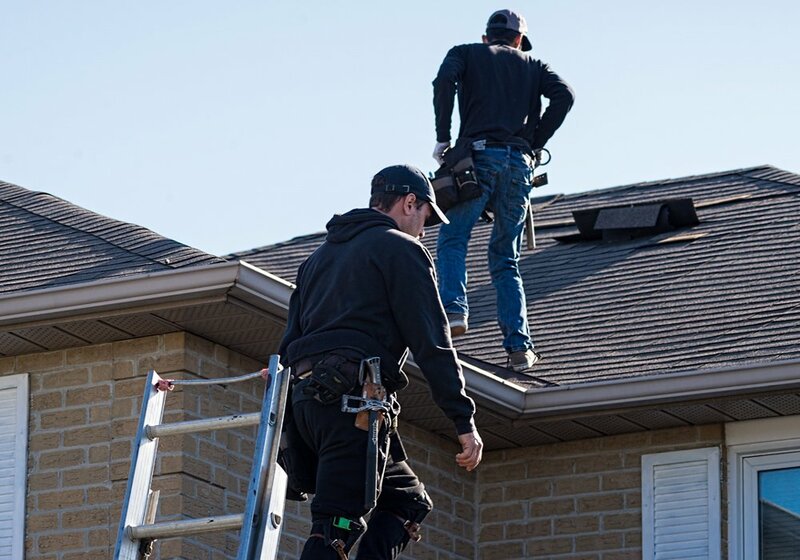 Roofing contractors, Austin All Roof, are here to help with all your gutter needs. It’s best to call in the experts when a gutter problem arises, getting the problem fixed right the first time. The best time to call is right away when dealing with gutters and water damage. Waiting too long will only cause more damage to your home. Our team is ready to get started on your gutter installation. Pick up the phone and give us a call today and we’ll work together to get your home back to working order. Your satisfaction is important to us, and we are ready to deliver a custom experience and high-quality service. Gutters are an important part of the structure of your home. They help to keep things dry and move water away from your home. It is important to keep gutters in good working order to avoid water damage inside and outside of your home. Without properly installed gutters, you could be facing expensive repair bills and problems with the foundation of your home. Foundation problems are typically very expensive, so avoiding them with gutters is a good investment in the future of your home.